With her army specialist husband serving in Afghanistan, Nicole Robbins was ‘pretty scared’ at the prospect of giving birth to their baby girl without him by her side. But thanks to her husband’s initiative, the hospital’s help and the wonders of modern technology – she didn’t have to. When a nervous Nicole went into an early labour at a Kansas hospital on Tuesday afternoon she was rushed into an emergency room where her husband was waiting for her…on Skype. 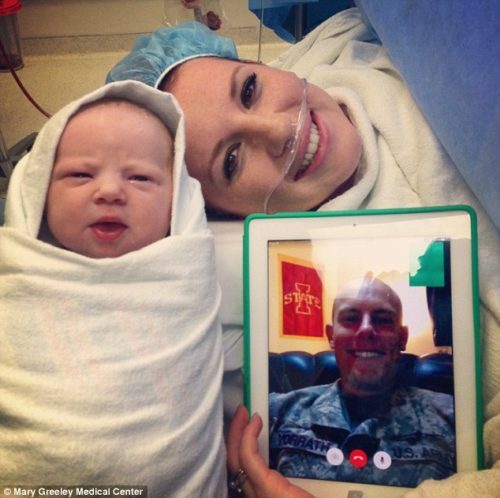 Robbins, an army specialist who is currently on a nine-month tour in Afghanistan, was determined to see the birth of his baby daughter and emailed the hospital to arrange setting up a Skype video conference for when his wife went into labour. Staff at Menorah Medical Centre duly set up a computer on a bedside table right beside Nicole so the soldier could be part of the momentous occasion. While in labour Nicole looked over at her husband who kept smiling at her, blowing her kisses and reassuring her, the new mother recalled to Fox News. Shortly after 2pm, Nicole gave birth to their little girl, who weighed in at a healthy seven pounds, two ounces. The baby girl, who has been named Silvia, is the couple’s second child. Nicole confessed that it was not ideal that her husband could not be with them in person but said it was incredible that he was there at all. ‘At least he was part of the journey through Skype. It’s just been amazing,’ the beaming mother told Fox. Despite the obvious downsides, Nicole says she believes her husband’s job is ‘extremely important’ and that she wouldn’t change it. ‘He will always carry that with him – he knows that he was there to witness the birth of his daughter,’ Nicole said, as she lay in her hospital bed, rocking her new-born. Now Nicole is looking forward to Robbins returning home and meeting baby Silvia in person.